Learning about agriculture may seem intimidating if you do not come from an agricultural background or don’t have previous experiences in the industry. Don’t let this discourage you. There are a multitude of different resources that are easy to comprehend and will make learning about agriculture enjoyable. 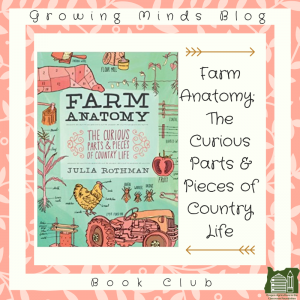 The book, “Farm Anatomy – The Curious Parts and Pieces of Country Life” by Julia Rothman is a great example. This book is absolutely fantastic for learning about agriculture and will make you feel much more confident once finished. It is laid out in a fun and approachable way with each page strewn with diagrams and colorful images that will make remembering the detailed information seem like a breeze. 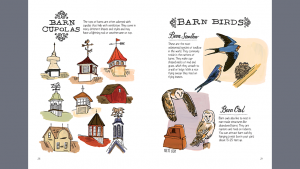 Excerpted from Farm Anatomy © by Julia Rothman. Used with permission from Storey Publishing. Filled with a captivating personality, the book enthralls the reader to continue learning. Turn to any given page and you are sure to learn at least one thing you did not know before opening the book. This reader-friendly layout, creates a great starting point for those who want to begin teaching agriculture to others as well. It covers many bases, including terminology, structures, identification and handy tips and tricks. This book is not only useful to people who want to start their own farm, but for people who are curious about how they work as well. You will be surprised to learn about how many moving parts are involved in the production of food. Rothman details everything from soil to construction and from animals to plants! Agricultural experts are sure to enjoy this book just the same as someone who is just beginning to learn about the industry. 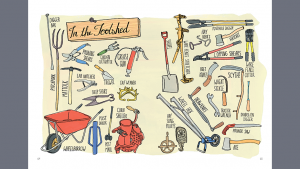 Rothman has useful tips for home gardeners, farmers and teachers alike. With just seven chapters, it will seem bittersweet when you finish.